She is built in aluminium to Lyme Boat’s 16m Vigilante Workboats design. The high speed catamaran features a deep ‘V’ hull with spray chines and tunnels designed to increase vessel efficiency in terms of performance, manoeuvrability, stability and fuel consumption. The Vigilante Catamaran provides a stable platform for a variety of offshore activities, including wind farm crew transfer and support, surveying, diving support or serving as a passenger ferryEach hull is sub-divided into three watertight compartments; engine room, accommodation and forepeak, plus a forward collision bulkhead. High density foam insulation is applied to aluminium walls and ceilings in all main accommodation and cabin areas for both thermal and acoustic benefit. The vessel is built under survey by the Sea Fish Industry Authority (SFIA) to SCV2 and MCA Code of Practice Category 2, allowing 60 miles from safe haven. And has been maintained meticulously, with a brand new engine and the other having been overhauled recently. She was specifically designed to remain at sea well in excess of 24 hours to assist offshore construction vessels. 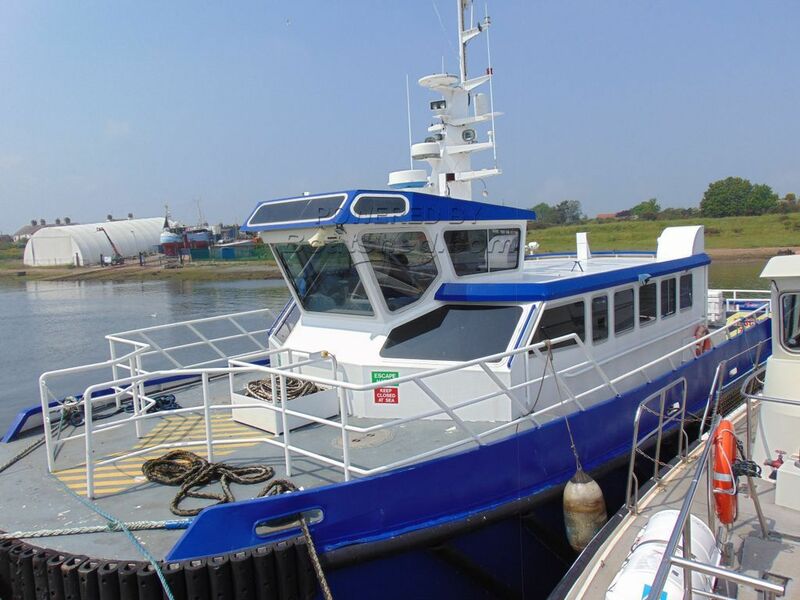 This Windfarm Service VESSEL Aluminium has been personally photographed and viewed by a representative of Commercial Boat Sales. Click here for contact details.